Grillkitchen T-BONE. More is hardly possible: versatility, weather-ability, solid sculpture and fun. The T-BONE is the outdoorkitchen which is initially modular and thereby multifunctional. Depending on the configuration, it is a grill, fireplace, workplace, sink, closet and last but not least a garden-design-element with built in communication effect. The materials are stainless steel, wood and concrete. Firmly assembled to be a weatherproof, rock-solid garden kitchen. No matter what extreme weather events it is exposed to – it resists all exertions. Heat, frost, rain, snow, blazing sun, wind and all other weather conditions. The T-BONE is so rugged, that we will give you a 12-month grill-season-guarantee. All single elements of the T-BONE all-weather-kitchen are combined in a way, that they are noticed as a design-unit. Regardless of whether you want to purchase the kitchen bit by bit or at once. Grillkitchen block. 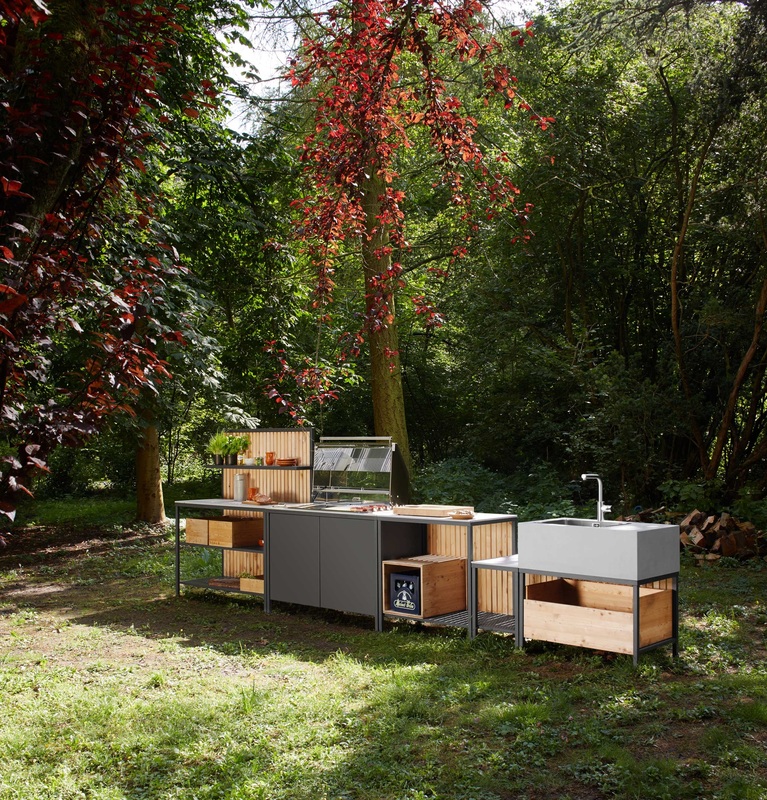 The modular outdoor-kitchen with its conscious, simple structure and industrial aesthetic. Perfect, for outdoor life and cooking. Completely made of materials for outdoor use, which require no maintenance at all and can stay outdoors year-round. The striking back walls pick up the aesthetics of a picket fence and also ensure that the kitchen looks pleasing from behind. Made of untreated larch wood which will be coated with a natural patina over the years. With a gas-grill-element and single-modules in two different heights, expandable and combinable at will. With a frame made of umber-grey powder-coated stainless steel and boxes made of untreated larch wood. With a deep industrial sink, which is available in ceramic or stainless steel, and with a fitting, suitable for outdoor use. With open or closed wooden boxes which can be carried into the house. 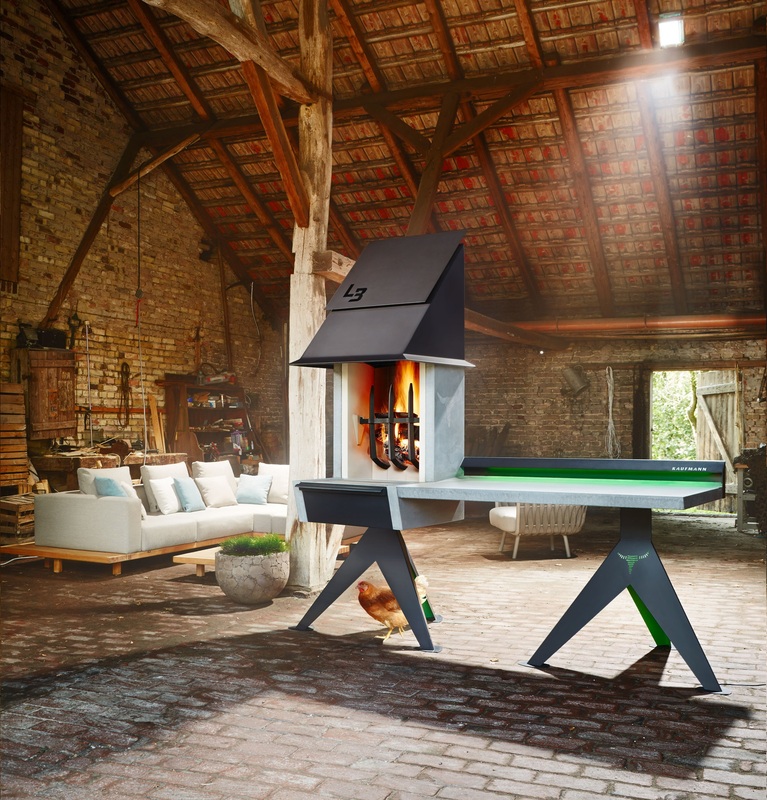 The L3 is a design bbq with integrated fireplace for the garden. Absolutely weatherproof and designed for whole year use. On request with LED light package for the workbench and the inside of the feet. 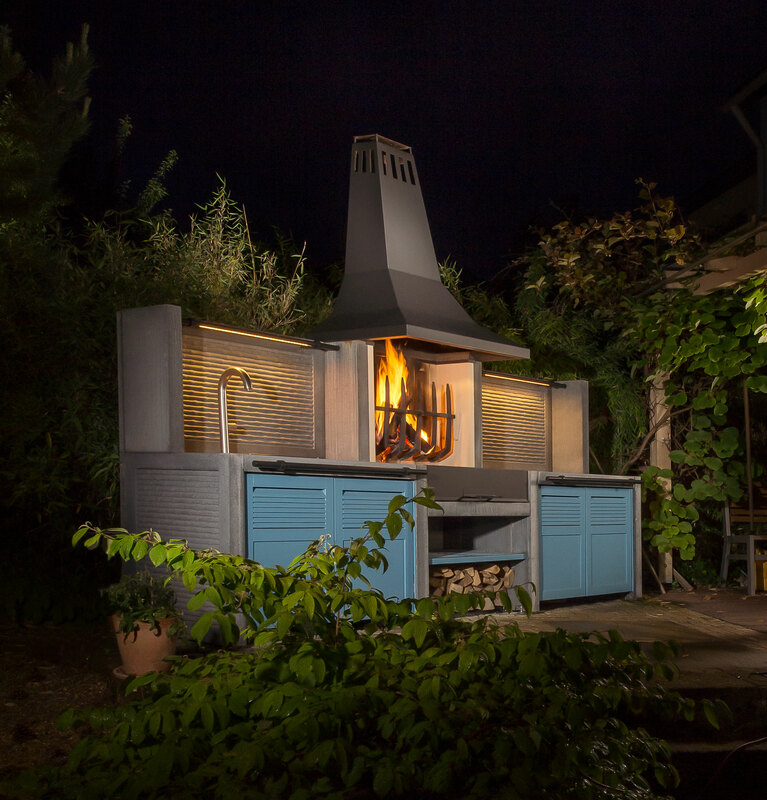 900 kg of concrete, cast iron and stainless steel are an eye-catcher that offers the best possible barbecue conditions.The silhouette of the concrete is L-shaped, 3 tines in the fire basket, 3 exhaust outlets and 3 feet, this is firmly integrated in the design. L is synonymous for light, because the L3 is the little brother of the T-BONE, which doesn´t hide with its bbq possibilities. To be honest, life is too short for half-baked compromises. Be crazier, braver, funnier, just enjoy. In short, celebrate life!